Former Governor of Plateau State and serving senator, Joshua Dariye, wept today, after a High Court in Abuja, sentenced him to 14 years’ imprisonment on charges of criminal breach of trust and misappropriation of over N1.16bn belonging to the state. “Be merciful. You are a Christian, your name is Jacob,” Mr Dariye had told the judge before his sentencing. However, Justice Adebukola Banjoko convicted and sentenced him on 15 out the 23 counts preferred against him. A High Court of Federal Capital Territory High Court sitting at Gudu, on Tuesday, convicted and sentenced the former Governor of Plateau State, Joshua Dariye to 14 years imprisonment for diverting public funds to the tune of N1.126billion. Senator Joshua Dariye Dariye who was governor of Plateau State from 1999 to 2007 and the current Senator representing Plateau Central, was found guilty on 15 out of the 23-count criminal charge the Economic and Financial Crimes Commission, EFCC, preferred against him. The court said it was satisfied that the defendant, being a public officer that had full dominion and control of ecological funds the Federal Government released to Plateau State in 2001, converted and diverted same for his personal use. It held that the ex-governor criminally misappropriated funds and acted in violent breach of public trust and his oath of office. Nevertheless, the court discharged and acquitted the ex-governor on 8-counts which it said was not sustained with sufficient evidence. Dariye had before his sentence was announced by trial Justice Adebukola Banjoko, pleaded the court to temper justice with mercy, describing himself as a victim of circumstance. In a plea of allocutus he made through his lawyer, Mr. Paul Erokoro, SAN, Dariye said he was deceived by his bank. Erokoro insisted that his client who he said served his state diligently, became tainted owing to pervasive corruption in the public service. “This man has suffered. We urge my lord to temper justice with mercy”, Erokoro pleaded, adding that case of his client was different from that of ex-governor of Taraba State, Rev. Jolly Nyame who was jailed 14years for stealing public funds. 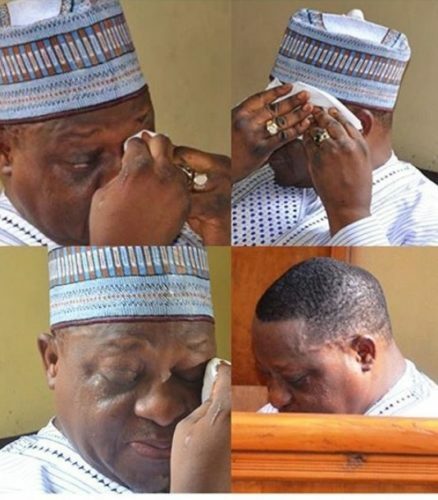 However, EFCC’s lawyer, Mr. Rotimi Jacobs, SAN, urged the court to impose the maximum sanction, accusing Dariye of failing to show any remorse for the crime he committed. “My lord should consider the conduct of the defendant who has stalled his trial since June 2007. Is he remorseful about what he has done? He is not! He has not shown any remorse. He still believes that he has not done anything wrong. “The prisons are congested with the poor and those that cannot afford their daily meal, but the big men are not there!”. Jacob’s urged the court to give a sentence capable of serving as a deterrent to other public office holders. Irked by the submission, Dariye challenged EFCC’s lawyer, accusing him of deliberately inciting the court to take severe decision against him. “You are not God! Your name is Jacob, as a Christian you should have mercy! You cannot predict my state of mind. Let’s not spoil tomorrow because of today. Can you raise your hand to swear there is a saint in Nigeria?”, Dariye bellowed from the dock. In her verdict, Justice Banjoko said she was not persuaded by Dariye’s claim of being a victim. Decrying what she termed as “brazen act of systematic looting” while the defendant held sway as the defendant, the Judge noted that Dariye was at a point, richer than his state. While the court sentenced the defendant to 2years imprisonment on each of the counts bordering on misappropriation, he was handed 14 years for the counts involving criminal breach of trust. The court held that the sentence would run concurrently, even as it directed EFCC to return all the funds it recovered in the course of the investigation into the coffers of Taraba State. The court had earlier in the judgment that lasted over six hours, noted that following a Mutual Legal Assistance Request from the Metropolitan Police in London, it was uncovered that Dariye sequentially laundered funds from Nigeria into National West Ministers Bank in the United Kingdom, using an account he opened in the name of a fictitious firm. It observed that a former detective with the Met Police, Mr. Peter Clarke who testified as the ninth prosecution witness, PW-9, during the trial, disclosed that Dariye wired funds from an account the fictitious firm- Ebenezer Rednar Ventures- operated with All States Trust Bank in Nigeria, into nine separate accounts he opened at Barclays Bank in London. Clarke who led a team of Met police officers that arrested Dariye on September 28, 2004, had informed the court that a warrant of arrest that was issued against the ex-governor after he jumped bail in London and ran back to Nigeria to escape being prosecuted on money laundering charges, was still valid. Justice Banjoko held that evidence before the court confirmed huge outflow of funds from the Plateau State treasury, into accounts Dariye operated with All States Bank and Lion Bank (now Diamond Bank), using the name of the fictitious firm. Describing circumstances that surrounded the opening of the accounts as suspicious, as no picture was used in the opening mandate, the court stressed that signature of the ex-governor appeared in four places on the account opening documents. It noted that admittance by All States Bank that it granted the defendant waiver to operate the account without the required mandate picture, led to prosecution and conviction of some of its key officials. Justice Banjoko held that forensic analysis confirmed that signatures on the account operated in the name of Ebenezer Rednar Ventures belonged to Dariye. She said the account was opened on December 19, 1999, without proper documentation and with false and untraceable address, observing that Dariye had in his statement before the London Police and the EFCC, admitted that Ebenezer is the name of one of his children. “As at the time the account was opened on December 19, 1999, the defendant was still the governor of Plateau State. Wrong account opening form were used, details were falsified, all in a bid to conceal the identify of the true owner of the account”, the court held. It noted that one Daniel Haruna who was the second signatory to the said account which was opened as if it belonged to an individual but operated as a corporate account, could not be located. The court maintained that Dariye was “the face behind the mask” that operated the account, stressing that the defendant, being as a public servant, was not permitted by law to operate a foreign account. “The court is satisfied that Ebenezer Rednar Ventures and Chief Dariye are one and the same person. The defendant is adequately capable of answering to any charge against the firm”. Though Dariye had in two applications dated May 7 and June 7, 2001, used Plateau State to apply for a total of N3billion from the ecological fund, only about N1bn was approved for him. The ex-governor was said to have personally collected the cheque from the Central Bank of Nigeria, on July 12, 2001. EFCC, through its witnesses, told the court that the N1.126bn ecological fund meant for reclamation and rechannelization, was diverted into different private accounts by the defendant. While reviewing the proof of evidence that was laid before the court, Justice Banjoko observed that the sum of N280m from the fund was said to have been shared to three beneficiaries, among whom included former Vice President Atiku Abubakar who allegedly received N100m through his firm, Marine Float. A former Deputy Senate President, Senator Ibrahim Mantu was said to have also received N10m, even as EFCC told the court that whereas the money that was given to the ex-VP was for the North East wing of the Peoples Democratic Party, PDP, the defendant equally donated N100m each to the South West and South East wings of the party on July 20, 2001, as well as N66m to the Plateau State chapter of the party to be shared to all the 274 wards in the state. 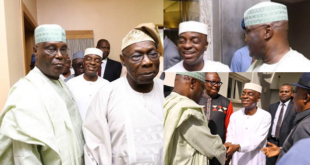 The anti-graft agency told the court that the N100m which was sent to PDP South West through a then Minister of Special Duties, Dr. Yomi Edu, was subsequently returned to Plateau State by ex-President Olusegun Obasanjo. While EFCC alleged that the defendant used N250m to purchase a property in London in September 2001 through the Chairman of Pinnacle Communications, Dariye however claimed that the fund was used to refurbish TV and Radio stations in the state. Besides, Dariye was said to have bribed one Dr. Nkuma who was a Permanent Secretary at the Ecological fund office with N80m to facilitate the release of the fund to him. Justice Banjoko held that Dariye failed to adduce any reasonable explanation for the funds he released to the ex-VP and the PDP. The court said it was satisfied that Dariye was giulty of dishonest missaprropriation and criminal breach of trust. It noted that out of the total ecological fund, only N550m was paid into the coffers of Plateau State following a hand written instruction the defendant gave to All States Trust Bank which he used to clear the cheque from CBN. Though the court held that EFCC could not establish that Dariye used N250m to acquire a flat in London, it however found the defendant guilty of illegally using funds meant for ecological project for other purpose. The Met Police had through its ex-investigator, Clarke, told the trial court that Dariye was arrested with his personal assistant, Christabel Bentu, in a hotel in London. Clarke said Dariye’s arrest and subsequent detention was a fallout of an investigation into a credit card fraud involving one Christopher McQuiney who he said was caught with 11, 500.00 pounds concealed in a brief case. The former Met investigator told the court that McQuiney, who was arrested and taken to a police station in North East London, confessed that the money belonged to his boss, Dariye. Dariye’s request for Clarke to be recalled to the witness box during his defence was declined by the court. EFCC closed its case against the defendant after it called 10 witnesses that testified before the court, even as the defendant called a total of 16 witnesses to defend the charge against him. Dariye had earlier lost his bid to disqualify Justice Banjoko from presiding over his trial. He had in a petition to the Chief Judge of the FCT, Justice Ishaq Bello, alleged that the trial judge had on several occasions, openly exhibited “manifest and undisguised bias’’ against him. Aside asking Justice Banjoko to disqualify herself from further presiding over the trial, the defendant prayed the CJ to transfer the case-file to another court, a request that was refused. Dariye had also failed to persuade both the Court of Appeal and the Supreme Court to quash the charge against him.